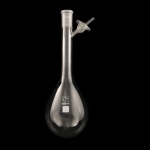 Kjeldahl shaped Schlenk tube. 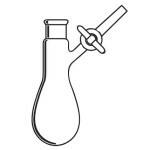 Kjeldahl shape facilitates heating and stirring while permitting easy trasfer of liquids or solids. Lower portion of flask fits in standard heating mantles. With standard taper outer joint. 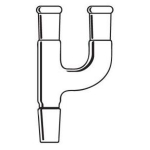 Choice of glass or PTFE stopcock plug or adjustable PTFE valve. Capacity 10mL. Outer joint size 14/20. PTFE stopcock. Capacity 25mL. Outer joint size 14/20. PTFE stopcock. Capacity 10ml. Outer joint size 14/20. Glass stopcock. Capacity 25ml. Outer joint size 14/20. Glass stopcock. Capacity 50mL. Outer joint size 14/20. Glass stopcock. Capacity 100mL. Outer joint size 14/20. Glass stopcock. Capacity 100mL. Outer joint size 24/40. Glass stopcock. Capacity 250mL. Outer joint size 24/40. Glass stopcock. Capacity 500mL. Outer joint size 24/40. Glass stopcock. Capacity 1000mL. Outer joint size 24/40. Glass stopcock.